The online cat news information portal Katzenworld extends its brand by launching the UK’s first World Cat Federation cat Club under the Katzenworld Cats Club brand. Earlier this year part of the Katzenworld team met with the World Cat Federation in Bran Castle in Romania as part of the Magnificats World Cat Show and part of this was to finalise the creation of the first World Cat Federation cat Club in the UK called Katzenworld Cats Club. What is the World Cat Federation? The World Cat Federation eV, or just WCF, is an international association of cat clubs, which is registered in Germany. There are 280 organizations worldwide associated with the WCF. President is currently Anneliese Hackmann from Essen. The WCF has been successfully working on the development of animal protection laws in the European Parliament in Strasbourg. The WCF allows the breeders of affiliated clubs to register their cattery names internationally. They created standards for pedigreed cats of which she has currently published 61. The WCF trains judges for exhibitions and organizes the examines. The WCF has established exhibition rules that the exhibition, and the division of the cats in separate classes. Generally, the WCF is designed to promote international contacts of the cat clubs affiliated. Our new logo depicts the six continents on which the WCF has members. The rainbow coloured continents are framed by our premise. 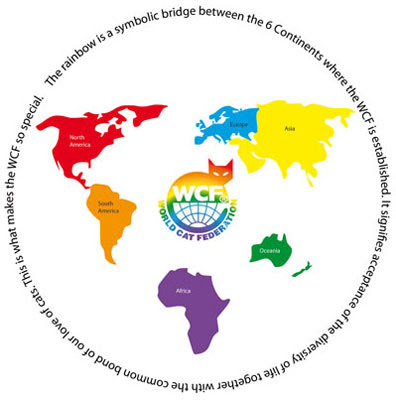 The rainbow is a symbolic bridge between the 6 continents on which the WCF is established. It signifies acceptance of the diversity of life together with the common bond of love of cats. That is what makes the WCF so special. Why did Katzenworld choose the WCF over joining one of the existing cat registries in the UK? As the WCF has a strong core value of animal protection it is one of the reasons that attracted Katzenworld to form a cat club under the governing rules of the WCF for the UK. The WCF club enables Katzenworld and their team to run cat shows where members of the WCF are able to bring their cats along to events similar to those organised by the existing organisations such as the GCCF or TICA while adding a focus on cat care and animal welfare as a natural extension of their work through the news platform. Additionally, the traditional cat show format of the WCF is also less stressful for cats and due to its generally more relaxed nature a lot easier for newcomers. The current plan is to host a minimum of 2 shows per year starting from January 2019 while building up the memberships. For the events, Katzenworld plans to involve organisations and veterinaries to provide education and advice for cat owners and breeders.